Who says introductory classes in Architecture have to be dull? 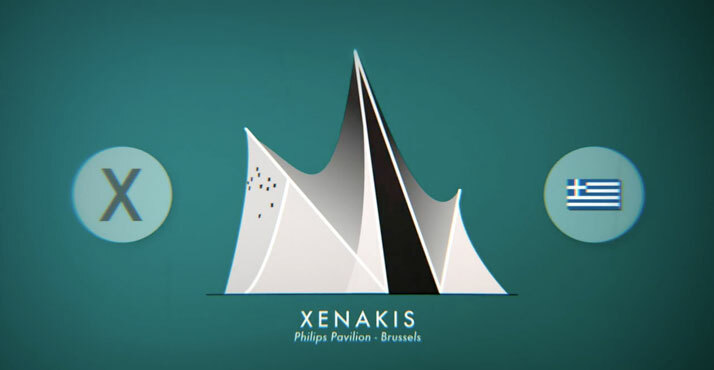 Not now that architect Andrea Stinga and visual artist Frederico Gonzalez have composed an animated alphabetical index of the most important architects. From Alvar Aalto to Zaha Hadid, The ABC of Architects rounds up 26 architects with their best known buildings, turning architectural history into a Technicolor-inspired nursery rhyme, where jolly buildings now come to life dancing to the sound of a catchy sing-along. Regardless of whether you know the featured architects, or you don’t, you will enjoy this. So next time you study for that architecture test, this can provide a fun brush-up. However, it comes with a warning: Press play at your own risk, you might not be able to get the jolly tune ''The Butterfly from Eugene C. Rose and George Ruble'' out of your head for the rest of the day. A. Alvar Aalto: Säynätsalo Town hall, Finland. B. Luis Barragán: Satellite Towers, Mexico city. C. Santiago Calatrava: Satolas airport railway station, Lyon, France. D. Luís Domènech i Montaner: Antoni Tàpies foundation, Barcelona. E. Eduardo Souto de Moura: Paula Rego's House of Stories, Cascais, Portugal. 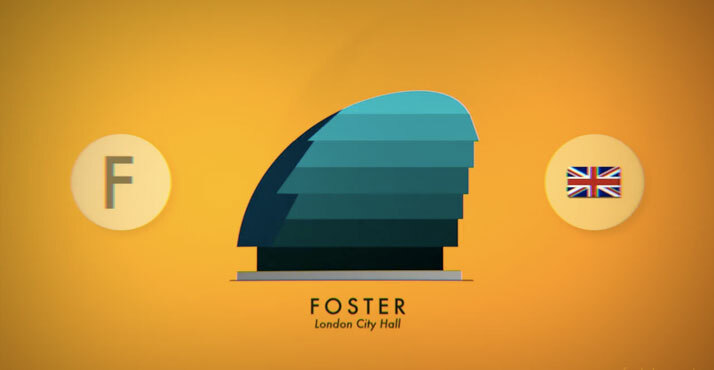 F. Norman Foster: London City Hall, England. G. Frank Gehry: Guggenheim Bilbao, Spain. H. Herzog & de Meuron: Beijing National Stadium, China. I. Arata Isozaki: Palau Sant Jordi, Barcelona. J. Philip Johnson: The Glass House, New Canaan, United States. K. Louis Kahn: National Parliament of Bangladesh, Dhaka city. L. Le Corbusier: Villa Savoye, Poissy, France. M. Ludwig Mies van der Rohe: Barcelona Pavilion, Spain. N. Oscar Niemeyer: National Congress of Brazil, Brasíl. O. Joseph Maria Olbrich: Secession building, Vienna, Austria. Q. Giacomo Quarenghi: the Smolny Institute, St. Petersburg, Russia. R. Renzo Piano + Richard Rogers: Pompidou Centre, Paris, France. S. Álvaro Siza: Ibere camargo foundation, Porto Alegre, Brazil. T. Kenzo Tange: Tokyo Olympic Stadium, Japan. U. Jørn Utzon: Sydney Opera House, Australia. V. William Van Alen: Chrysler Buildin, New York, United States. W. Frank Lloyd Wright: Guggenheim New York, United States.